The FRID HD RooTenna from Laird is an innovative antenna system that gives the operator ultimate system flexibility. The Radome is UV resistant ASA plastic, the hardware is stainless steel and the mounting plate inside for adding electronics is removable and customizable by the user. The die-cast enclosure can be pole or wall mounted. A heavy duty tilt bracket is available for those installations requiring up or down tult. Eleven (11) engineered knockouts are provided; nine sized for N connectors and two sized for a cable feed through. This series of antennas is available with a choice of six different circularly polarized UHF antennas integrated into the Radome cover. 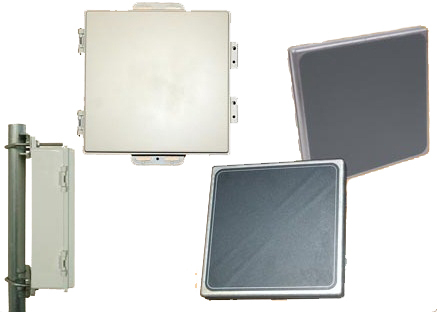 These antennas cover the standard 902-928 MHz, 865-868 MHz RFID frequencies as well as a wide band version that covers 865-960 MHz. All are available in a choice of RH and LH circular polarization. These antennas feature very low VSWR axial ratio and a fixed SMA connector.